Top of our applicant Lee’s bucket list was to visit the Aston Martin factory in Warwickshire for a tour. Thanks to a personal contact of one our ambassadors we were able to turn a ‘Good Day’ into a rather special one. We are extremely grateful to Louise and everyone at Aston Martin for making this trip happen. As for the day itself, we will let Lee tell you in his own words…. I had a fantastic day on Wednesday 18th May 2016, at the Aston Martin factory in Gaydon, Warwickshire. On arrival we were greeted and introduced to our tour guides Des & Steve, who explained what the tour and day involved over coffee & biscuits. The tour started with the heritage of Aston Martin with the first David Brown vehicle made going through the years to the current day with the DB11. The knowledge of the guides was second to none. Then we proceeded into the factory which was incredible the size of the building was amazing. We were able to see the full production line from the seats and dashboard being upholstered, the engines installed, all the way through to a complete vehicle ready for testing. Unfortunately we weren’t able to take any photographs in the factory this down to client’s vehicles privacy until the client takes delivery of their car. Not even the factory workers know who the client is. They even had a full working model of the James Bond DB5, with all the gadgets. This would set you back a mere £28,000. After the tour we had a lovely lunch in one of the conference suites, during which the Chief Finance Officer Marc Wilson took time out of his day to see how we were enjoying the tour and answer questions. 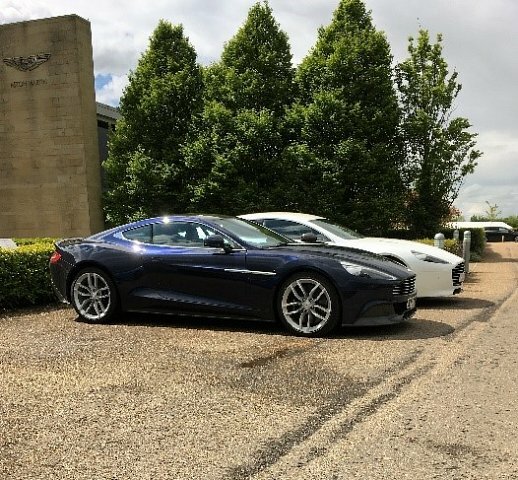 We then had a ride in the two Aston’s pictured, the Vanquish (blue) and the Rapide (white) going through the local villages in the Cotswolds. The Drivers Steve & Simon showed us what the cars are capable of which was unbelievable, class at its best. Could have stayed out in them all afternoon. I would like to say a huge** thank you to everyone who was involved in arranging this experience from the David Randall Foundation and Aston Martin. I couldn’t have asked for a better day. Thank you.